I promise to use it only to send you Quality Home Improvement Tips. An interior color scheme normally begins with a single color. Do you want a blue room for a baby boy, a red room for your bedroom, or a off white sun room. For the blue baby boy room you can choose a monochromatic approach. This is the simplest approach and all you would have to do choose different shades of blue for the room. The wall could be a lighter blue such as Benjamin Moore Mediterranean blue and the trim could be a darker blue. If the blue on blue doesn't suit your liking then you can use a contrasting color like vanilla ice cream on the trim. If you desire more variety, you can use 3 colors that are equal distances from each other on the color wheel. If this color scheme is too busy for you then remove one of the colors. Just remember that oriental rugs normally have combinations of several colors. Paint manufacturers usually have different color combinations displayed in their brochures. A home style magazine (Martha Stewart etc.) typically has a nice variety of colors schemes spread through the magazine. Be mindful that what looks good in a magazine may not work in your home. We can help you choose the color arrangement that is easy on the eyes and adds style to the room. 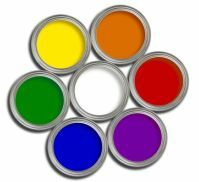 For your convenience we have arranged your color scheme choices from simplest to most complex. Monochromatic Colors - tints or shades of the same color. Analogous Colors - colors next to each other on the color wheel. One color is dominant. Complementary Colors - two colors opposite each other on the color wheel. Analogous Colors With Complementary Accents - Two colors next to each other on the color wheel combined with a third color that is opposite them. This one can be tricky so be careful.